The best way to meet us is to come along to the Angel and Greyhound, where we hold regular social meets. People start to congregate at about 9:30, with most being there by 10, and you can be sure of meeting like-minded climbers, hill walkers and the occasional caver. Ask for Chairman Paul Russell, Membership Secretary Carol Watts or any OMC member who'll make you welcome. Please check our events calendar for the next social meet dates. Alternatively, several of our climbers meet at the Oxford Brookes climbing wall, Rock Solid, on Wednesday evenings. Most of us get there by 8pm although there is a smaller group who meet at around 5:30pm. Both groups tend to have a social drink after their respective sessions. 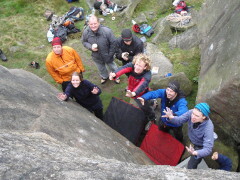 Since Oxfordshire has few natural climbing areas, or indeed any hills at all, OMC activities revolve around our meets. Popular areas to visit include the Peak District, the Lake District, Scotland and Snowdonia, where we have our club hut. See the events calendar for details of this season's meets. If you are interested in attending a meet please come along to the social meet prior to the weekend of the meet. This is when arrangements will be finalised. If you can't make that please contact us. Social events take place all the time and include cinema trips, parties, and barbecues. To join, or renew your membership, please use the following online form. We will contact you for payment after processing. Alternatively, download the application form (PDF format). Completed paper forms together with payment should be returned to the Membership Secretary, Carol Watts.